Shack Size 1200-1800 sqft. 1801-2800 sqft. 2801-3500 sqft. 3500+ sqft. Shack Shine is Now Operating in Barrie, Ontario! For as long as he can remember, Brandon Rea has always wanted to start a business. After working for someone else for six years, he was finally ready to make his dream come true. But he knew starting a business on his own wouldn’t be easy. That’s why he decided to join a trusted brand with proven success: Shack Shine. 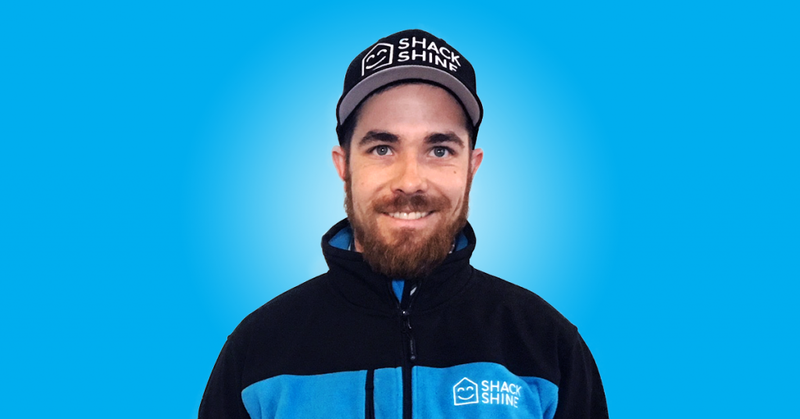 Brandon is now the proud owner of Shack Shine in Barrie, Ontario. His hardworking crew has hit the ground running and is ready to serve new customers today. Below, Brandon shares what he’s most excited about in his new journey as a franchise owner. Why did you choose Shack Shine? I’ve always dreamed of being my own boss. I chose to start a business with Shack Shine and O2E Brands because I knew I would have the tools and support to succeed. What was your background prior to Shack Shine? I was a territory manager of a B2B industrial and safety supplier for six years. There, I managed large industrial accounts such as Magna and Mars Canada. What are you looking forward to most about being a Shack Shine business owner? I’m looking forward to having the ability to serve my home community of Barrie, Ontario, while doing something that I am passionate about. What are your passions outside of work? My biggest passions are outdoor activities, such as fishing, canoeing, hiking, atving, snowmobiling, hockey, golf, and camping. How are you involved with your community? I am actively involved in our local fishing community. Do you have any role models or key motivators in your life? My mom. She taught me to persevere through anything no matter how hard it is, and to never take no for an answer (even though she sometimes regrets this one). She also taught me that nothing in life is free — you need to work for everything you get. Barrie is unique because it is the gateway to the north! Lake Simcoe is a gorgeous lake to get to call home. In Barrie, you get the best of both worlds: you are 40 mins from Toronto but you feel like you’re at the cottage everyday, with swimming, boating and fishing at your doorstep. Barrie is growing so fast because more and more young people are realizing just how much there is to do here and in the surrounding area. Fun facts about you, or anything else you’d like to share? I would fish every day of my life if I could. I left my hometown of Burlington, Ontario, and purchased a house in Barrie to be closer to the outdoor activities I love so much, like fishing and camping. Please join us in welcoming Brandon to the Shack Shine family! Check out our family of brands.